CPU: 32bit 100MHz MIPS CPU. WIN NT/2000/XP/Vista Virtual COM driver. Windows 7 Virtual COM driver. SCO UNIX real TTY driver. NOTE: Any data from RS232 will be converted to RS422/RS485 and send to virtual COM port 1. So we can monitor such data via IP network. NOTE: Any data from RS422/485 will be converted to RS232 and send to virtual COM port 2. So we can monitor such data via IP network. NOTE: Any data from virtual COM port 1 will send to RS232 port. So we can trigger data communication via IP network. NOTE: Any data from virtual COM port 2 will send to RS422/485 port. So we can trigger data communication via IP network. APORT200: Ethernet to 2 RS232 port. APORT020: Ethernet to 2 Ground isolated RS232 port. APORT400: Ethernet to 4 RS232 port. APORT040: Ethernet to 4 Ground isolated RS232 port. 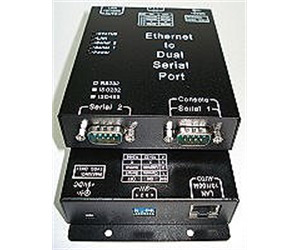 APORT202: Ethernet to 2 RS232 and 2 Ground isolated RS422/485 port. APORT800: Ethernet to 8 RS232 port.